Going off to college is one of the most exciting experiences of your life, but it requires a lot of planning. Besides figuring out your financial aid package and what classes to take, you also have to move in and out of the dorms or your off-campus apartment every year. In many places, this means having to choose between renting an expensive moving van through a moving services company, or discarding a lot of stuff in the university dumpster. With Zippy Shell, college students now have another choice for their moving and storage needs. Ready to move into your dorm or off-campus housing? Zippy Shell will deliver one if its shells right to your driveway. You simply have to fill it up and tell it where to go. Once the Zippy Shell has been delivered, you can take up to 72 hours to fill it. And you never have to worry about your things getting lost or damaged — each Zippy Shell is fully secured, allowing you to know that your stuff is safe. As soon as you’re done loading stuff into your Zippy Shell, call us. We’ll pick up the entire Zippy Shell and transport it to the location of your choosing. Even if you live in a dorm, you’ll be good to go. Zippy Shell containers fit in a parking space in your parking lot, or along the curb in a loading zone. If you’re living off campus, our drivers can deliver Zippy Shell to your apartment or rental house and leave it in the driveway or parking lot. Don’t worry about finding a place for it to go, we can get our Zippy Shells almost anywhere. You’ll have 72 hours to unload once the shell is delivered. Just let us know when you’re finished unloading it and we’ll pick it up. When the school year is over, you can do it all over again. Just order the Zippy Shell and start packing while your studying for finals or wait unit your done with the semester and spend an entire day getting your stuff; we’re flexible. We’ll take your stuff back home for the summer or can provide storage services if your parents aren’t too keen on the idea of having their home full of boxes. 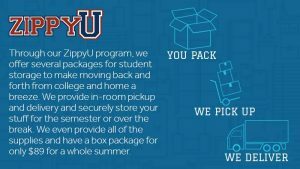 Through our ZippyU program, we offer several packages for student storage to make moving back and forth from college and home a breeze. We provide in-room pickup and delivery and securely store your stuff for the semester or over the break. We even provide all of the supplies and have a box package for only $89 for a whole summer (3-4 months). Give Zippy Shell a call and let us know you want to use the ZippyU student storage. One to two weeks before your move-out date, we’ll ship or personally deliver a moving supply kit to you. The kit will include all the materials you need to pack and label your belongings. As soon as you’re finished packing, we’ll send a ZippyU representative to retrieve your boxes from your dorm and securely pack them into our truck, where they will be unloaded and stored at our secure storage facility. Our storage services include a facility that is temperature-controlled and secured. That means you won’t have to worry about your stuff being exposed to the heat of summer. Our secured location means that you can be gone all summer without worrying if your stuff will be OK when you get back. When you’re ready to move back in to your dorm or off-campus housing, just let us know and we’ll return your belongings right to your doorstep. This year, don’t waste tons of money throwing out most of your stuff because it won’t fit in the back of your compact car. Contact Zippy Shell at (614) 915-0801 to get a quote for a low-cost and safe way to move and store your stuff for college.